and not just because Dad and Mum are in it. Dad, Mum, the girls and I went fabric shopping yesterday. 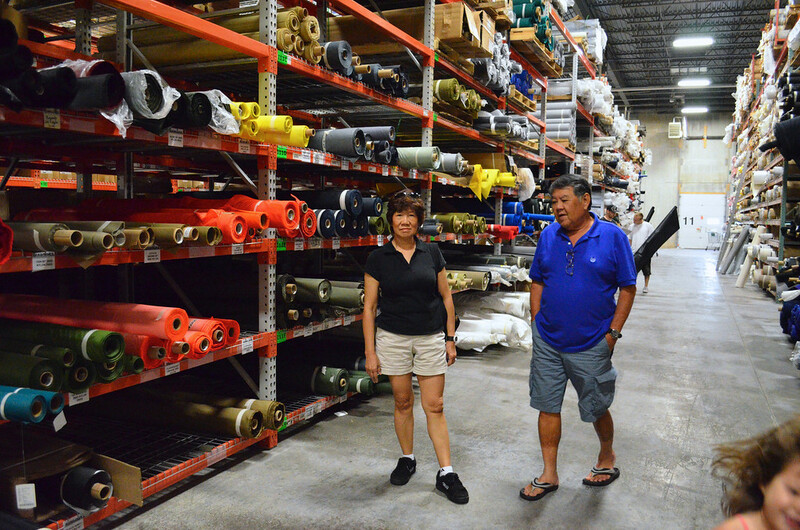 This first stop was Rochford Supply Inc, which is a marine upholstery store. It's not exactly the place to go if you're leaning towards home dec, apparel fabric or quilting cotton. I always feel right at home in it because it's stocked with all my favorite fabrics - robust nylon packcloth, cordura, polyester canvas in various deniers (the measure of weave), webbing, buckles of all kinds, vinyl, foam and other related padding materials and neoprene. Yes, neoprene, in any color you want, albeit thinnish. Also grosgrain binding (not ribbon) and vinyl and other bindings, some of which are cut on the bias to navigate curves. In large rolls. Isn't that wonderful? 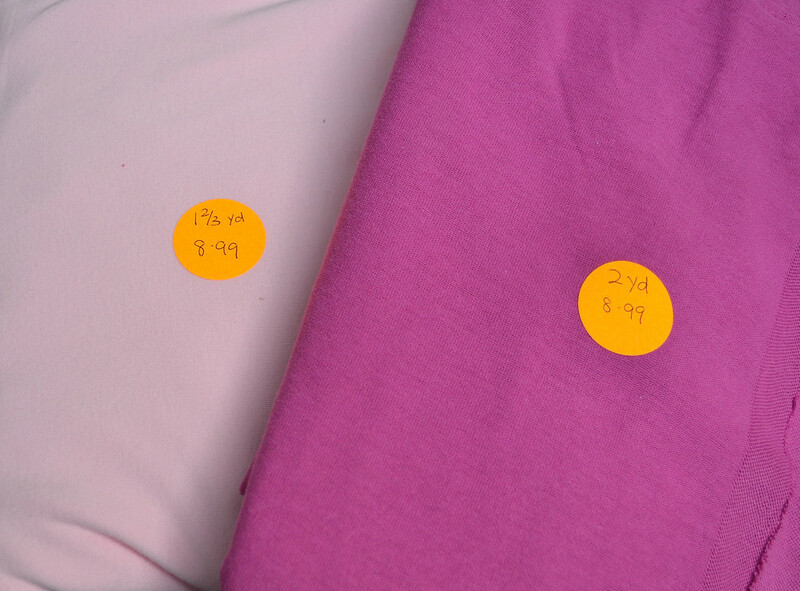 Did you know you could buy bias tape in materials other than the cotton/satin/fleece single-fold/double-fold sort you find in packets in sewing shops? Amazingly, I didn't buy anything here (haven't depleted my stash yet), but Dad happily stocked up on the fabric he needed to sew his bowcases when he gets back to Singapore. Lovely. 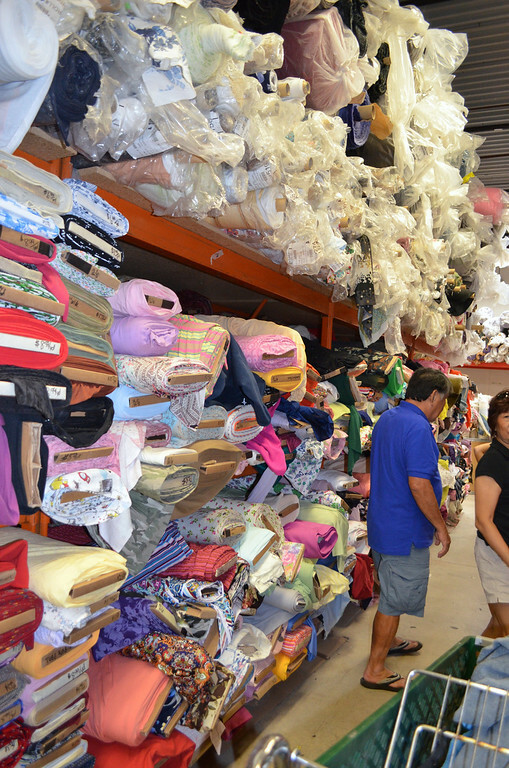 Then we drove to SR Harris, the fabric warehouse where all the fabric is always 50% off. For you quilting folks , I took a photo of one of its many cotton aisles. Designer stuff and non-designer stuff. I didn't linger in the cotton section though. I moseyed over to the knits. and return the bolts to where you found them. Good stuff. 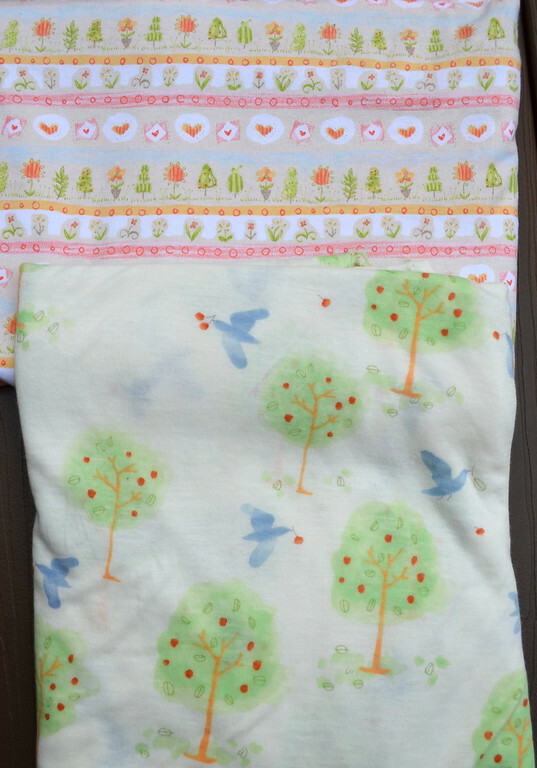 I bought those two pink (yes, I probably was mad) knits, along with these print knits, which I thought were sooooo pretty. That little diversion aside, I was actually there for fleece for the girls' coats. 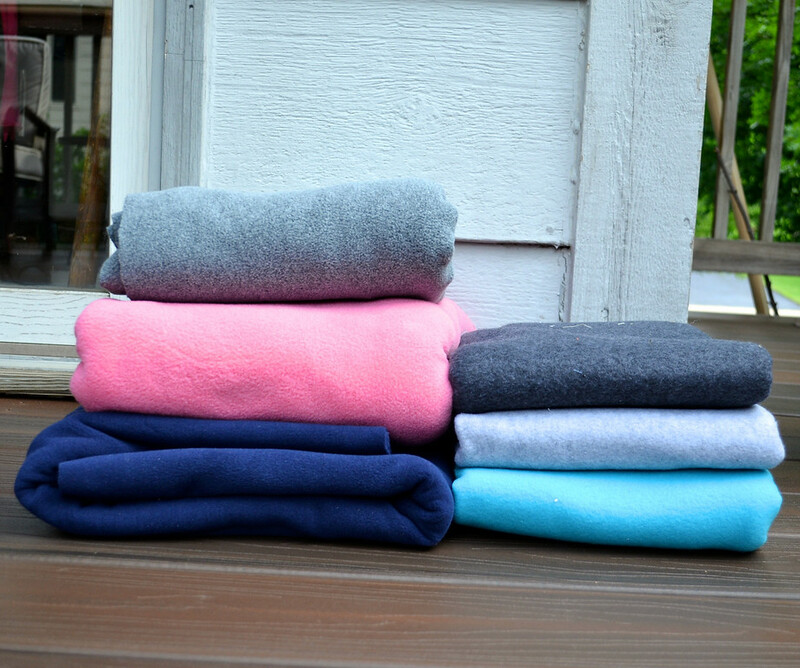 This was polartec windpro somethingy fleece, which retails at $20 a yard. We paid $10 a yard, which works out to $10 per coat for the girls. I photographed it (left) together with the same amount of the thickest fleece I could find at Joann (right), which I'd bought last year to sew the same coats. I lost the motivation quite soon after, largely because the fabric wasn't inspiring me. I'm glad I waited because this polartec fleece is delicious. Each layer of polartec is - I kid you not - a quarter inch thick and smooooooooooth like suede. 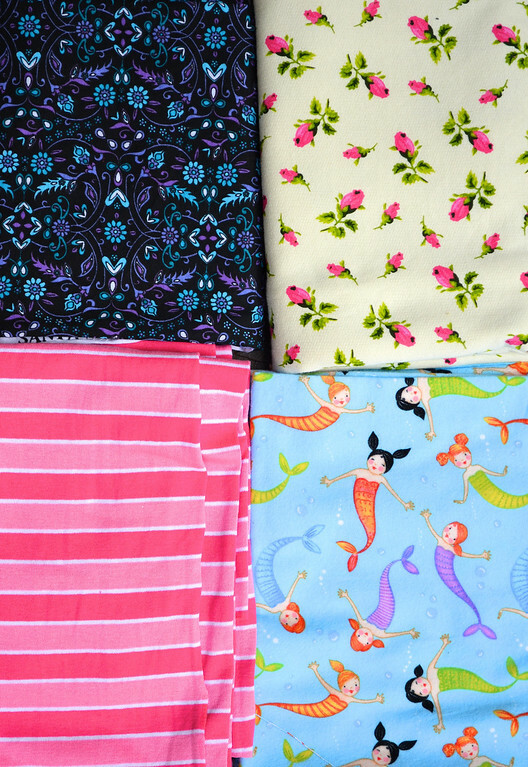 The girls picked their own fabrics for doll dresses and mermaid tails and school clothes. Love those little mermaids. Kate wants to me to make her a mermaid tail with all those mermaids on them. I love how literal a three-year-old's mind is. 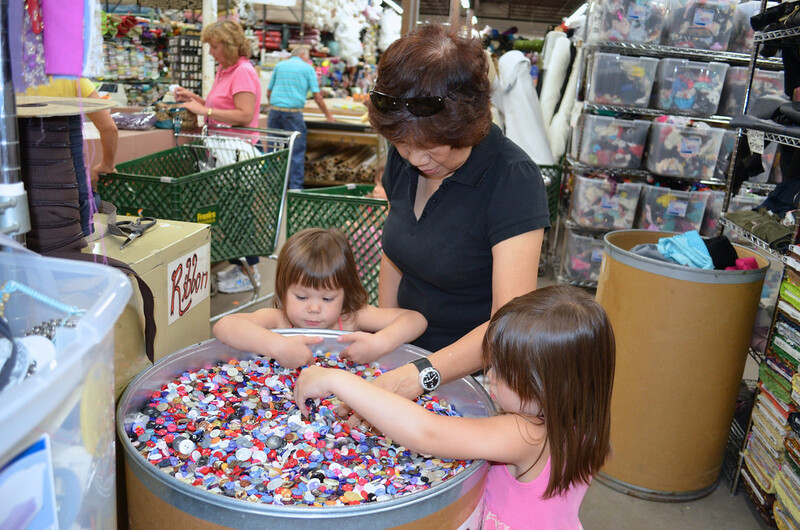 Here are Grandma and the girls keeping themselves busy at the button barrels. See those transparent storage tubs in the background? Full of zippers/notions/ribbons/trims. All sorts of zippers - by the yard, in bulk, separating, non-separating, metal coil, plastic coil, whatever. There's also leather- whole hides hung to the ceiling, scraps by the pound and everything in between. Very exciting store, to say the least. I love coming here, but I only indulge myself once every two or three years, since - ahem - I don't really need any more fabric, and I have too many children with me to make this a sane, let alone regular, experience. So a good day shopping. Not sure who was more pleased- Dad or me, with our respective finds. 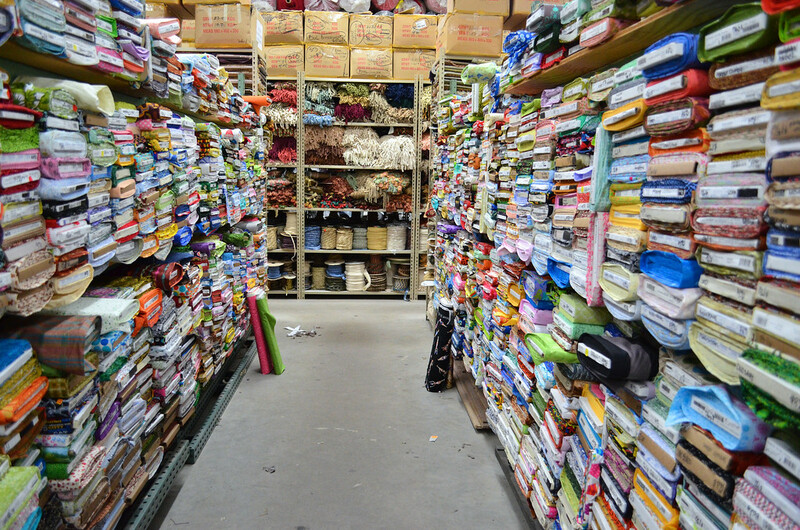 While we were fabric-hunting yesterday, it occurred to me that one of the many reasons I feel at home in Minnesota is that I now know exactly where to go to find the different kinds of fabric and supplies I need for my various hobbies. I've never been able to do the online shopping thing because I'm such a tactile person. Even with three small kids, I'd much rather drive us all out as one frightening entity to track down obscure fabric and hardware sources all over the city. I love talking to the business owners and learning about the language of the industry, or about the different materials and (extremely useful) alternatives and viable substitutes. I've been to the traditional batik factories in Malaysia and I'd love to visit the equivalent fabric and haberdashery industries here in the US someday. Wouldn't it be incredible if we could peep into the silk factories of China and sit with the weavers in Java or Uzbekistan and learn to make ikat? Well, that's my fabric fantasty. What's yours? Oh my gosh, what a dream place to shop! As for my fabric fantasy, when we lived in Guatemala my parents hired a woman to teach 7-8-year-old me how to weave using a backstrap loom. I loved the lessons, and started making a small wall hanging, but then we moved (to France, where they don't do that sort of thing at all). I've always wanted to re-learn how to do it! oh! you're so lucky to have such stores around you. I'm totally relying on the internet! My husband was recently working in San Francisco area and I asked him to go to a couple of quilting stores with a small list of things I needed. He went in and introduced himself as "I'm a quilter's widow..." LOL, so maybe he's lucky that we do not have stores like this around here. He would have left me and re-marry a non-craftoholic! Wow! You went to fabric heaven! Great purchases! 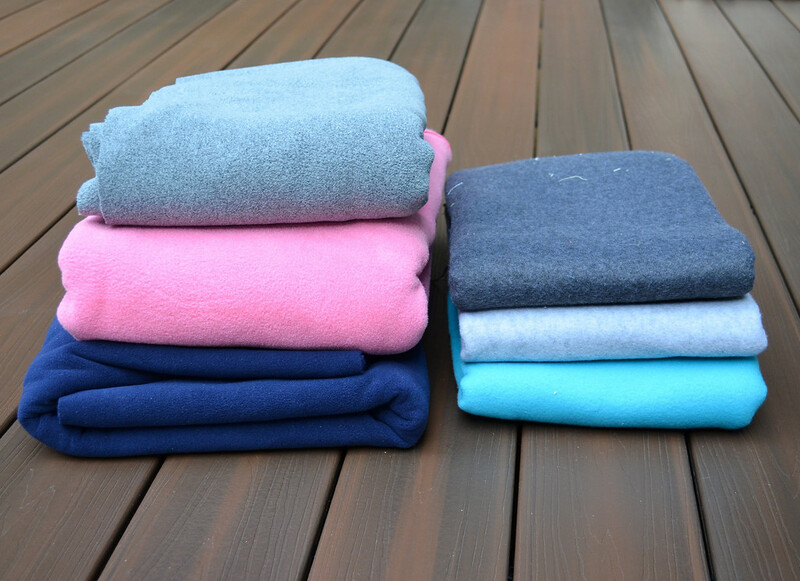 wow, that JoAnn's fleece photo is instructive! I think I would sew a coat out of the luscious stuff you found! 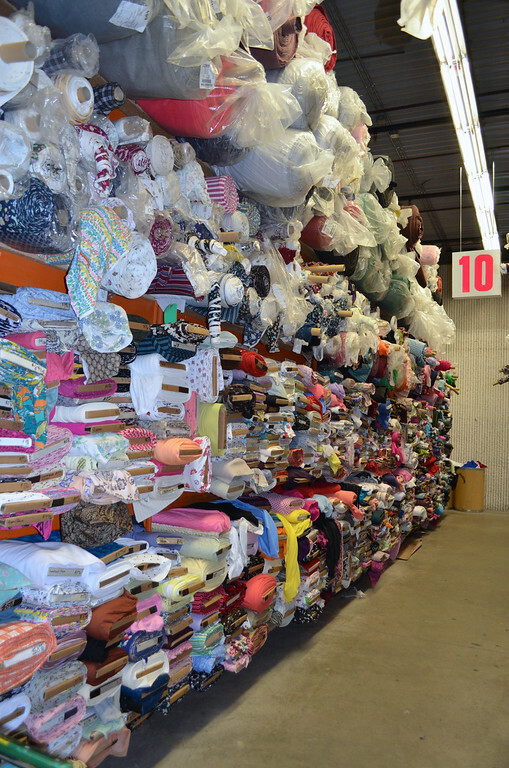 We have a fabric outlet from the NYC garment district - it's fabulous. Not cut-your-own fabulous, but still cool. And it's got leather hides hanging from the ceiling too! I agree with Katy, those stores you visited sounded like a good fabric fantasy! Some ladies at my church regularly go on shopping trips in the states which don't interest me at all as it's Kohls, Target, etc. Where I'd want to go is there! I guess my ultimate fabric fantasy would be having the time & money to buy all the fabric I wanted and be able to use it all! Holy Cow, that's a huge store!!! I've never seen anything like it! I wish I could sew more with knits, but I have a hard time getting them not to bunch up or pull under my machine foot. 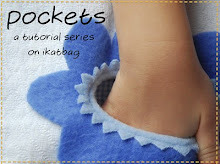 Have you ever covered working with knits before on your blog?? thanks for the virtual trip to fabric heaven! How I envy you! I am somewhat new to my community and haven't found any gold mine fabric stores yet. It's been 8 years since I went to SRHarris. 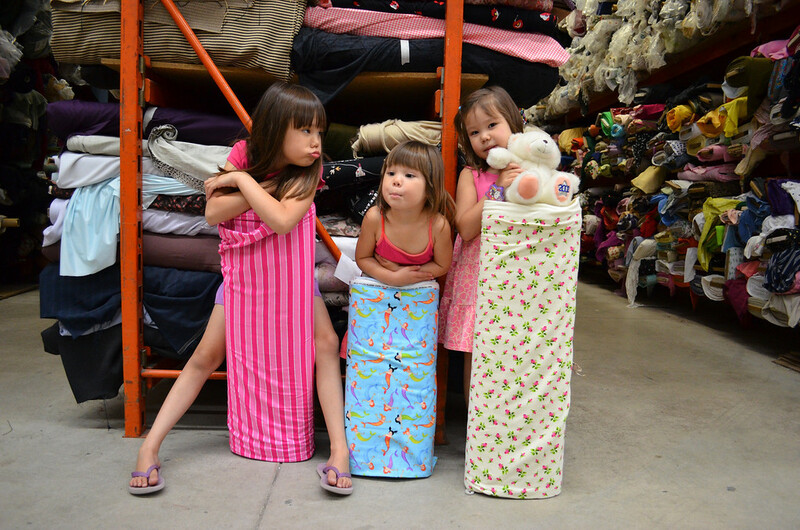 I am much more of a chicken about taking my kids to a giant warehouse like that, but you have inspired me. I'll have to head out there soon! I spend most of my fabric time at Treadle Yard Goods in Saint Paul, which has almost only natural fibers, but that marine supply store looks amazing! Hello durable backpacks for the kids! That's a great place to shop. I have never seen such a wonderful fabric and craft material shop. Thanks for sharing. Wow! I would love to be able to shop at those stores. I have to rely almost entirely on the internet. My local shops are small quilt shops. Not a lot of selection and very pricey. A few other blogs I follow have done this type of post so now I'm planning holidays in LA, Dallas and Minnesota! I live in a very small town in Brazil. Here we don't have many beautiful fabrics as you there. What do you think of sending me some of this fabrics? We could do some business! Sorry for my English, it is not very good. Here in NW Florida, we have one store that is similar, but not nearly as large as your store. The prices are terrific and I always buy a lot of stuff when I'm in there. 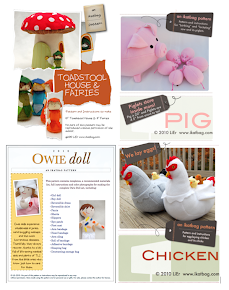 Isn't it great to share your love of sewing with your mom and dad? My mother in law is my sewing buddy. right now , that store is my fabric fantasy. There is nothing like that anywhere near where I live. Probably not in the whole country! Thanks for the Rochford supply tip, I had been to SR Harris but hadn't heard of Rochford-can't wait to check it out. What a huge treat! I could be there for days. No, I mean it. I don't do enough sewing for a special trip to a shop like this, but I'd want to wander the aisles and touch each and every bolt. I laughed when I noticed your Dad's "sock tan", he should wear sandals more often. Fantastic! I've never hear of Rochford but have been to SR Harris. I go even less often than you, but next time I make the trip I'll make a day of it and hit both! Thank you for sharing your addresses ! I want to visit that store, all those knits, and the polar fleece... It looks like my favorite store in France. They had great fleece, too, but they suffered a fire last fall. Sigh./.. Next time I'm in the Twin Cities, I think I'll go ! Thanks ! I nearly bought that tree and bluebird knit the last time I was there! I had it in my cart! I decided against it because it was thinnish for a t-shirt and I realized I wanted to buy it because I LIKED it, not for practical reasons. Now what will you make....? Wow. I sure wish we had stores like this in Nashville, TN. I could go crazy!!! You mean there are still people who buy fabric for practical reasons? Don't we all just buy them to hoard them? Hee. Wish we had that in miami, , I'd be there every week!! EEEEEKKKKKK. Oh my gosh, I want to go there. I wonder if places like that exist in the south? Atlanta maybe? I'm ready to find out and make a road trip. Wow! That takes fabric shopping to a new level. I'd be in real trouble. I love love love SR Harris. My husband and I just moved to Iowa from MN and every time I am home I go to SR.
Holy wow! I'd love to have access to a place like that! I would spend ALL DAY and way way too much money in a store like that. So on second thought, maybe it's a good thing I can't get to a place like that! I love SR Harris, I drop the kids off at my moms (who lives near by the Fabric outlet) and shop away! So much fun fabric! So much more knit to choose from then Joanns!